Grooming and cleanliness are probably one of the best things a dog owner can do for their dog, not only does this maintain a good level of hygiene, but also helps with the pet's health and keeps it safe from diseases related to hygiene. Bathing your dog regularly should be given the utmost importance. A pet living in unhygienic conditions is prone to infections. While bathing your dog you should be careful and take steps necessary for your dog's betterment. For example if water enters the ear of a dog while bathing it can get into the ear canal of your pet and cause it harm by giving your pet an infection. Infections of the ear caused by water can be very painful and uncomfortable for the pet, ear infections may cause constant discharge from the pet's eat and may also cause enough discomfort that the dog constantly shakes its head. Another important fact about bathing your dog is that not all breeds need to be given a bath at the same frequency, while some breeds require more bathing others might not. This typically depends on the fur and coat of your dog's breed. Hairy breeds of dog should be given a bath once in about 8 weeks, because if they get frequent baths they might lose the protective characteristics that their skin and coat provides them with. However in some cases hairy breeds can also be given frequent baths for a short while, for example if the dog is smelling bad due to some other health reason. 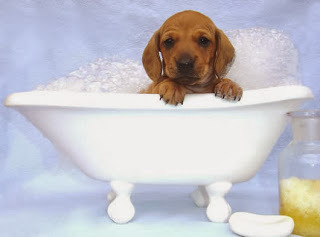 When bathing your dog be sure to avoid human soaps or other soaps that might be irritating to your dog. The sops that are made for humans have material that is especially not suited to dogs. Therefore be sure to use the shampoo products that are especially made for dogs, these are made with your pet's sensitive body needs in mind and will be gentle on your dog's coat and fur. When using a new product be sure to try it out first on your pet so that if there is any allergic reactions you come to know of them. Lastly when you are ready to give your dog a bath, be sure to have all the things together near a good source of water, this is necessary because dogs are generally excited by water and enjoy it and you don't want to be running around looking for bath products and towels while your pet is splashing water all over the place, Always use a dog conditioner on the coat it helps with combing after the bath. Bathing your dog should be a healthy and fun activity for both you and your dog, it will also keep your dog safe of many dog diseases associated with hygiene. Have fun bathing your Dog and remember cleanliness and hygiene should always be your first priority for the health of your dog.